CD review: "Live in Europe"
This review first appeared in the Summer 1994 edition of Blues Revue Quarterly magazine (now Blues Revue). 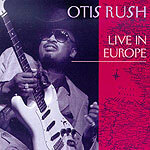 Along with Buddy Guy, Otis Rush is generally considered one of the foremost guitarists of the second generation of the Chicago school of blues. Unlike Guy, Rush has not issued all that many recordings  his reputation was cemented early on through his live performances in the early '60s. Still, any release from rush is to be welcomed. And this Evidence Music reissue of an Isabel Records (a French label) recording is among Rush's finest recordings. This "live" album recorded in 1977 in Nancy, France, follows 1992's "Screamin' and Cryin'" from Evidence, which was a reissue of a 1974 studio set previously unavailable stateside. While "Live in Europe" was recorded with 1977 analogue technology, the sound quality has a clean mix and clear pick up. There are some passages where one of the channels fades out and others where the backing band sounds mushy. More to the point, Rush's playing is impassioned and decisive. His picking here is vintage  imaginatively taking a song's theme and extrapolating it into the Stratosphere. He might play 14 variations on the melody, but each will be distinct. Rush shows his musical maturity in that each passage has a purpose, a goal  this isn't just mindless arpeggios and broken chords. As he works the themes on classic cuts such as "All Your Love" and "Feel So Bad," Rush displays total mastery of his instrument, showing both his vaunted technical prowess and a subtle sense of nuance. When he wants to, Rush can pick as fast as anyone  and is able to utilize all of the standard sound effects within the structure of his solos. At the same time, Rush's vision allows him to eschew macho posturing in favor of artistry  he invariably chooses to play the right notes, not necessarily the most. The backing band (Bob Lewis, rhythm guitar; Bob Stroger, bass; Jesse Green, drums), is strong, if not in his league, and the members have sense enough to stay in the background.